An 18th Century Symphonic Grand Tour celebrates the energy, vision and distinctive musical flavours of inspired composers creating the western cultural phenomena of the symphony and the symphony orchestra in the glittering musical centres of mid-18th century Europe with overtures, symphonies and arias by Abel, J.C. Bach, Paisiello, Cimarosa, Richter/Stamitz, Schmitt and Mozart. Exploring the period of "the birth of the symphony", the programme's repertoire displays the dazzling wealth of genius, creativity, musical dialects and musical personalities present in 18th century Europe, spotlighting the eloquence of Abel in London, the excitement of Schmitt in Amsterdam, the pumping energy of Richter/Stamitz in Mannheim, and the sheer elegance of Mozart in Vienna. Mannheim was considered the symphonic epicentre of the time - "the paradise of composers", "the musical Athens of the German speaking world". The programme celebrates the Mannheim orchestra's ideal of an orchestra of soloists, showcasing both the orchestra as a whole as well as its individual members - both historical figures and their contemporary colleagues. The programme features a number of works with solo parts written for specific, legendary 18th century instrumental virtuosi, including J.C. Bach's central aria "Semplicetto" from his opera Endimione written for star Mannheim flautist J.B. Wendling and Mozart's aria "Parto" from La Clemenza di Tito composed for trail-blazing Viennese clarinettist Anton Stadler. The programme harnesses conductor Simon Murphy's stylistic knowledge of, passion for and performing experience with this specific, early symphonic repertoire. The programme capitalises on his musical research into the area (which has resulted in the rediscovery of seminal orchestral repertoire and fresh symphonic gems) as well as on his acclaimed performing and recording work on Mannheim and other mid-18th century symphonists for premium Dutch label PentaTone Classics. Conductor Murphy is known as much for his abilities as a rehearser/ensemble builder as for his flair and genuineness on the concert podium. Murphy has enjoyed success performing the programme as a guest conductor with modern-instrument symphony orchestras, most recently in France in 2014 with the Strasbourg Philharmonic Orchestra. He has performed several versions of this programme with his own New Dutch Academy (period instrument) orchestra including concerts at the Holland Festival of Early Music Utrecht in 2007, the Haydn Festival at Schloss Brühl, in the orchestra's own symphonic series in The Hague's Philipszaal in 2010, and for Dutch radio in 2006 at Amsterdam's historic Felix Meritis with a series of EBU worldwide, live broadcasts. 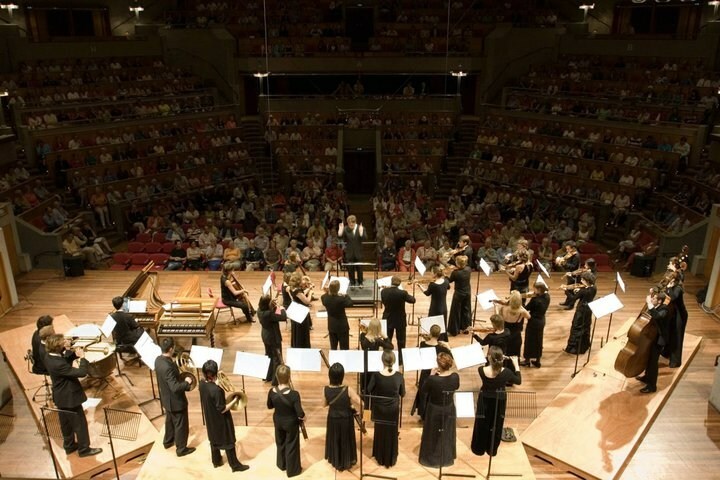 In terms of established classical repertoire, Murphy's live broadcast concert performances of Mozart, Haydn and Beethoven symphonies, including at the Amsterdam Concertgebouw, Vredenburg Utrecht and De Doelen in Rotterdam, have been identified by Dutch radio as highlights of the Dutch musical calendar, with several being subsequently released by Dutch broadcasters in special live CD portrait sets of the conductor. One of Murphy's proudest musical discoveries, Schmitt's exhilarating Symphony in E flat "The Hurdy Gurdy", is also featured on the programme. It was given its world première recording by Murphy on his disc of symphonies by "The Dutch Haydn" for PentaTone Classics, chosen by the label as one of its top 10 discs of its first ten years. The programme package includes fully marked-up performance material (personally prepared by Murphy), PR material and programme notes, including a personal introduction to the programme by the conductor. J. Schmitt "The Dutch Haydn" Symphony in E flat "Hurdy Gurdy"
W.A. Mozart Symphony no 31 "Paris"/no 35 "Haffner"/no 38 "Prague"
Alternative versions of the programme can include more of the Dutch touch, musically visiting the court city of The Hague with Graaf's majestic but nicely compact Symphony in D, alongside Amsterdam with Schmitt's Symphony in E flat "The Hurdy Gurdy".